It’s the end of year school holidays, and the Garden Route is teeming with visitors – Gautengers escaping urbanism and Capetonians escaping other inlanders who’ve overtaken Cape Town. 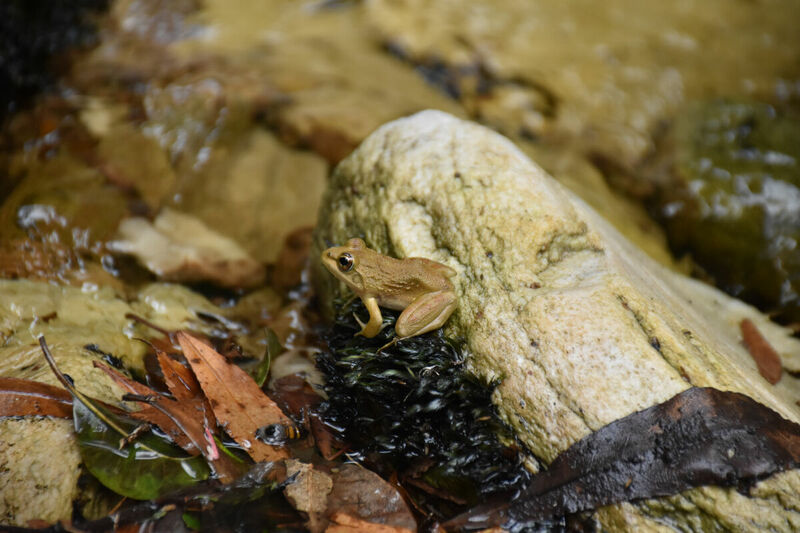 Yet, even with all the additional temporary residents, it’s still possible to find Eden on the Garden Route. My most recent visit to the Garden Route coincided with the New Year long weekend. And I was surprised to have not been overwhelmed with crowds (well, mostly). We arrived mid-morning, and set out for one of the walks in the Wilderness section of the Garden Route National Park. Avoiding the more popular trail to the waterfall on the Touw River, we attempted the Brown Hooded Kingfisher Trail, which follows the course of the Duiwe River. It also leads to a waterfall, albeit much smaller, and less dramatic. It’s a short, pleasant walk through the indigenous forest, along the Duiwe River, which sometimes looks more like a stream than a river. Apart from the forest rangers, we only came across two families on the two hour walk. Backtracking to the Ebb and Flow camp in Wilderness, we struggled to find a parking spot at the start of the Half-collard Kingfisher trail that leads to the Touw River waterfall. We’ve done the trail a few times before, so were happy to leave it to first timers. Instead, we walked the first 20 minutes of the trail to the Milkwood picnic site on the banks of the river. Clear, tannin stained waters invited us for a refreshing dip after the previous hike. Here too, there was only the occasional canoeist that paddled on their way to the waterfall. Heading into Knysna, the roads were clearly busy. So it was surprising to be the only hikers in the Knysna forests the next morning. Taking the dirt roads away from the bustle of the coast, we headed into the dense, Diepwalle Indigenous Forests. 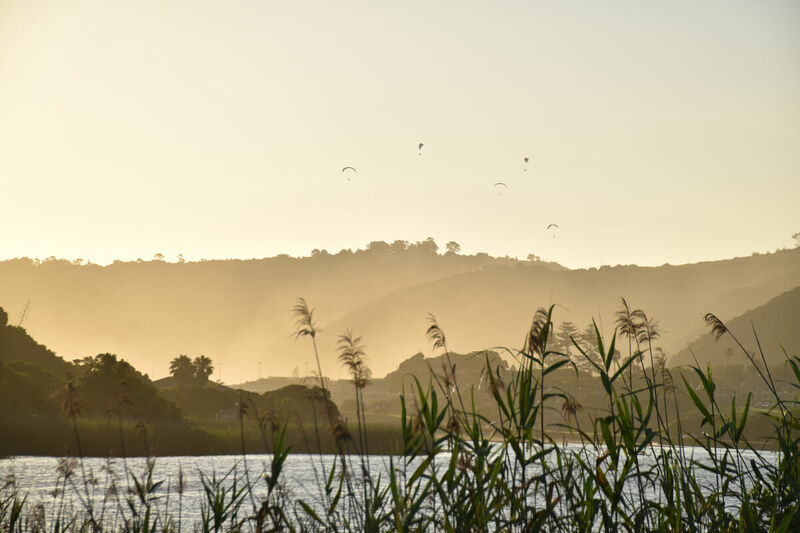 It, too forms part of the Garden Route National Park, and is one of the reasons that it has been spared the sprawl of Knysna. Yellowwoods, Beachwood’s, Forest Elders and other indigenous species create a welcoming respite from the summer heat. There’s also a chaos in the forest, but of a different kind. 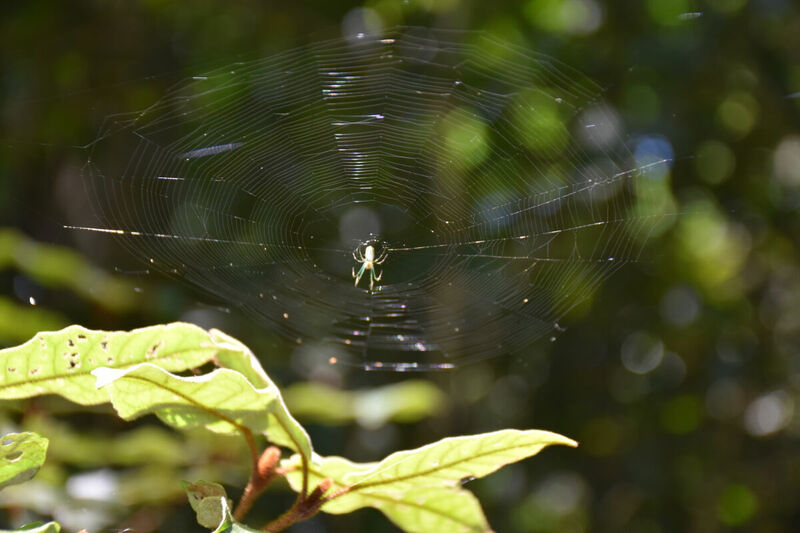 The forest is buzzing with cicadas and birds seldom seen, only heard. On one of the days, we tackled about 8km of the Elephant Walk. 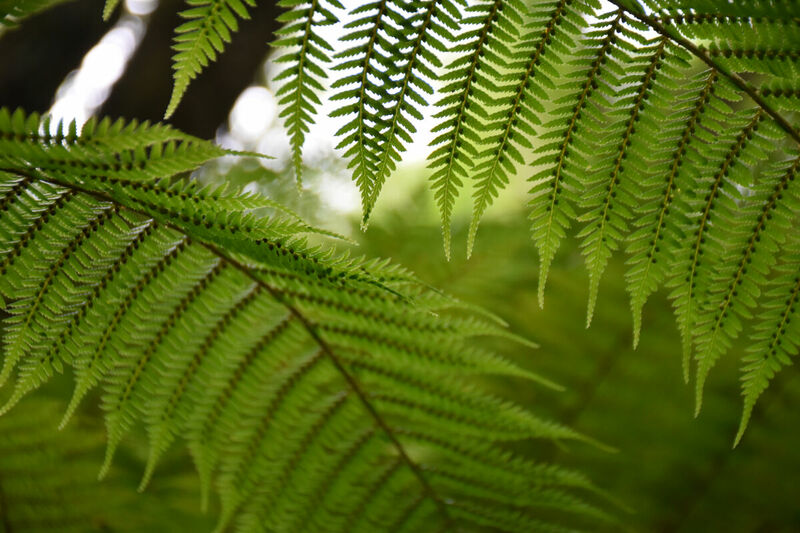 It’s a magical one, passing through shaded canopies, with the forest floor lined with ferns and patches of velvety moss, sometimes crossing crystal clear streams. 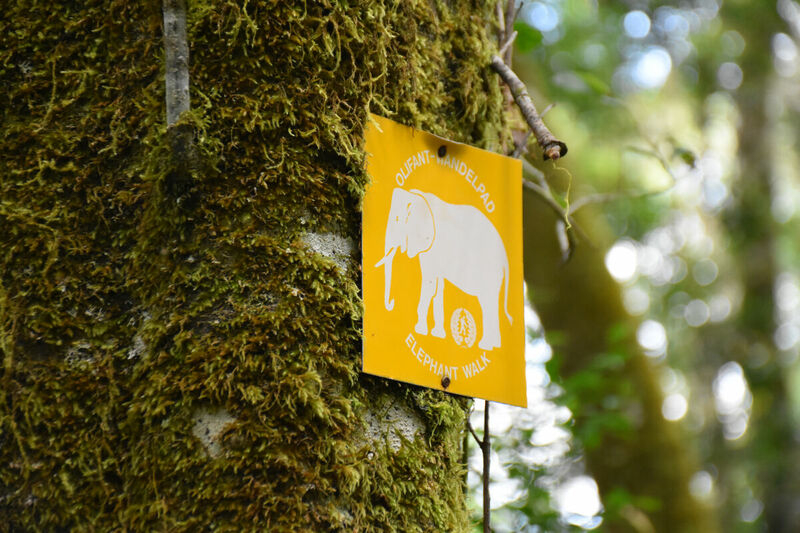 We didn’t get to see any of the remaining Knysna forest elephant(s) – they are so elusive, it’s still not known how many are left. We did come across what looked like dung though, with bits of twigs in it; possibly a few weeks old. But I’m no poo expert to say that it definitely came from an elephant. Another trail that we tackled was the 6.5km Terblans Walk close to Gouna. It also led through indigenous forests, and yet again we were the only hikers when we set off. It was also clear that no one attempted it earlier that day, as we waded through dozens of cobwebs spread across the path. 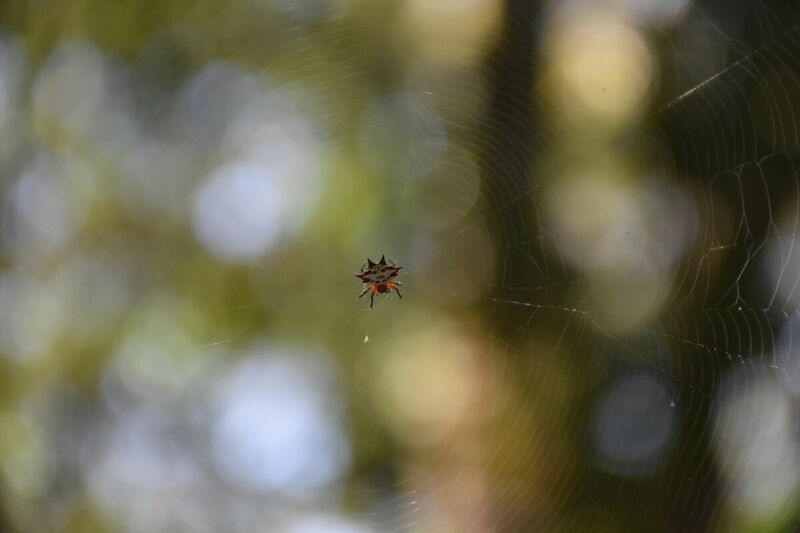 Arachnophobe will not do well in the forest. 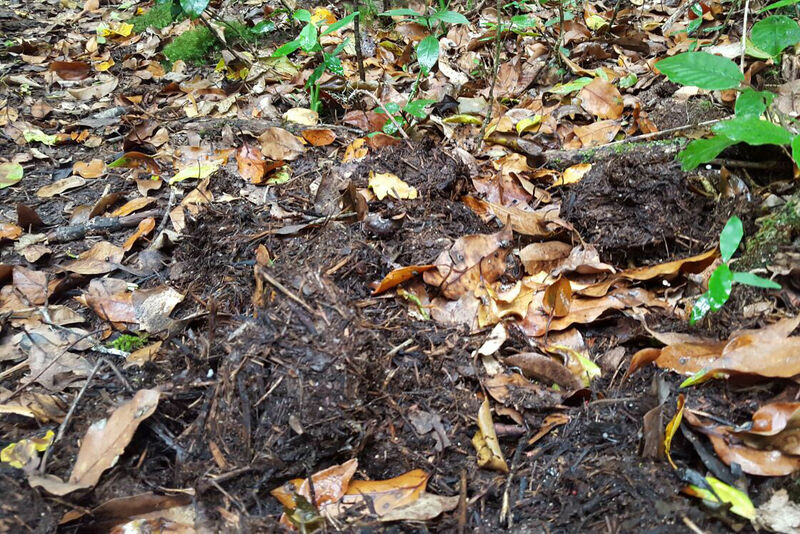 Is it elephant dung or just a compost heap? But we did venture into town. The local Ocean Basket in Knysna was overwhelmed by holiday makers that service could not keep up. By contrast, The Girls Restaurant in Wilderness were on their game as usual – I often go there for their prawns, which are so lip-smacking good, you may feel like skipping dessert. A trip to the Garden Route would not be complete without a stroll on the beach. We walked the 9km (return) from Brenton-on-Sea to Buffalo Bay and back, with the warm sea water lapping at our feet, and fynbos covered dunes setting the scene. It’s only the early birds that are up at 7:00am (as are the striking black oystercatchers), so the beach at Buffalo Bay was fairly quiet when we got there. The midday scene the next day, was very different, with the beach covered in umbrellas. Owing to its sheltered location in a bay, the beach at Buffalo Bay is perfect for a swim, and is pleasantly refreshing at the height of summer. There are other ways to escape the crowds on the Garden Route. On a previous visit, we were among just a few hikers on the scenic Robberg peninsula. In Wilderness, we walked on the boardwalks along the Touw River. Despite being in the town, it’s relatively peaceful. 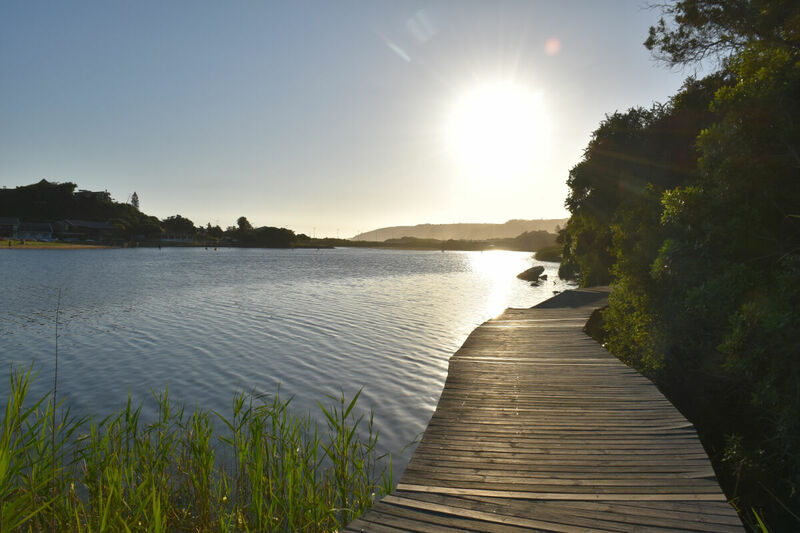 The Garden Route’s forests, lakes and coves lends itself to scenic walks. Perhaps it’s the vastness, perhaps they are not all well known, but there are many spots to take a break from other holiday makers on the Garden Route. 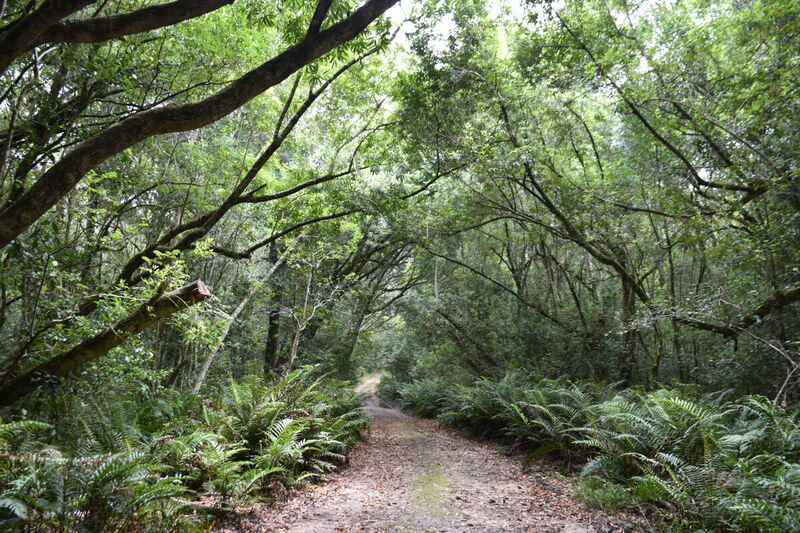 There are many trails to choose from in the Wilderness and Knysna sections of the Garden Route National Park. See the Sanparks website for details. Of the ones featured in this blog post, the Brown Hooded Kingfisher Trail is one the road that skirts Island Lake, just outside Wilderness town. Get the map from Ebb & Flow rest camp in Wilderness, where you’ll also need to get a hiking permit. The Half-collared Kingfisher Trail starts at the Ebb & Flow Rest Camp (close to the railway crossing). 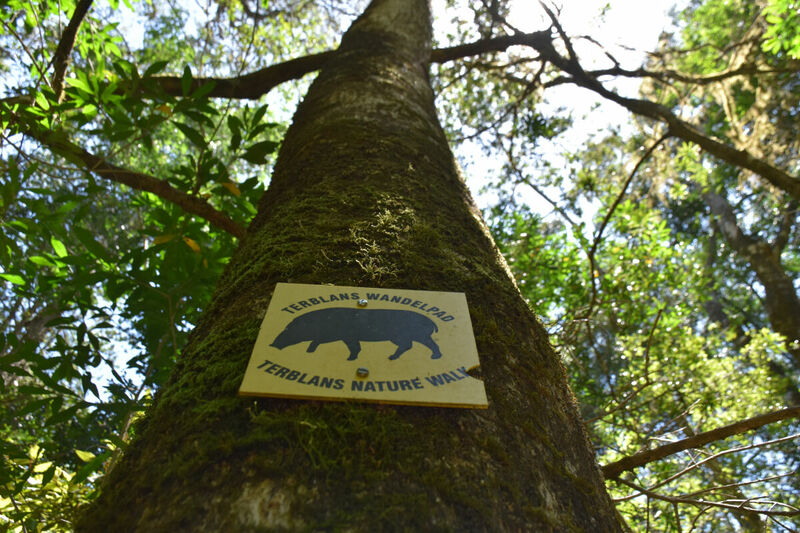 The Elephant Walk in the Diepwalle Forests in Knysna can be accessed from a few points on the R339 out of Knysna. The becomes dirt, but it scenic and accessible to sedans (at the time of writing). The Terblanche Walk starts at the Grootdraai picnic site, close to Gouna. 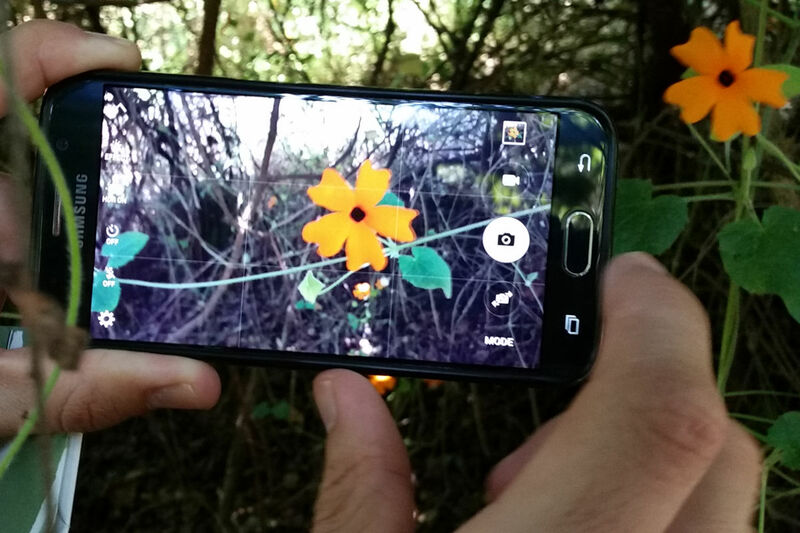 There’s limited to no cellphone signal on the trails.